There are studies initiated to promote Bodrum with its original values and its historical, cultural and natural beauty. Tourism professionals, journalists, travel writers, bloggers and internet phenomena coming from different regions of the world are being hosted in Bodrum within the scope of promotion activities organized by the Bodrum Promotion Foundation and organized for the first time last year. The Italian group of 10 that are welcomed with flowers in the airport on the Thursday, 1st June with the organization of BODTO and BOTAV, stayed at the Turgutreis town, and began an intensive excursion program on the morning of June 2nd. 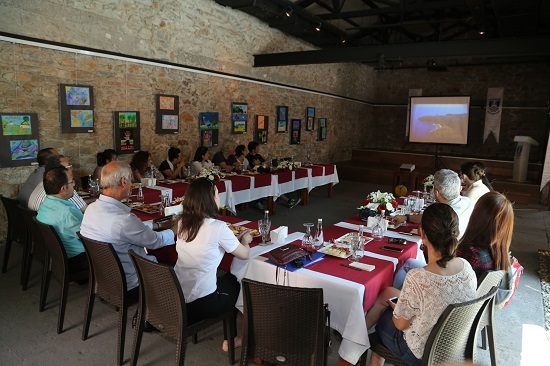 The crew started their excursion by touring Bodrum Castle and Museum of Underwater Archaeology and after that they attended the meeting which organized in the Bodrum Municipality Trafo Bodrum Hakan Aykan Culture and Art Centre. In the meeting, Bodrum Tourist Information Office Authority Başar Ertan, Bodrum Promotion Foundation General Secretary Cemil Bayraktar, with Bodrum Association of Hotels Chairman and Bodrum Promotion Foundation Board Member Halil Özyurt and BOTAV members, Bodrum Chamber of Artists and Artisans' Chairman Erdoğan Başyemez, Bodrum Marines Association Chairman Mustafa Demiröz informed Italian guests about Bodrum. The Italian guests were shown promotional videos of the Mausoleion project, the Bodrum bays and the Bodrum Cup International Yacht Races for them to reconstruct conducted by the Akademia Foundaiton. The guests who admired the beauties of Bodrum caught the opportunity to convey the questions they were curious about. Luca Vitiello, Italian travel blogger and producer, who shares his thoughts and feelings about Bodrum, expressed that Bodrum has one of a kind beauties such as white painted houses with blue windows. Expressing that cities are special values and what separates them from other places is such values, “We arrived in Bodrum yesterday evening but witnessed a wonderful sunset. This morning we went to Bodrum Castle and I was surprised to see it because it was very well preserved. We are here for 3 more days and I cannot wait to see more places in Bodrum. It would be great to discover the differences here” said, Luca Vitiello. Italian guests, the same day, visited the shipyards located in İçmeler to examine the boat production in Bodrum, world famous Bodrum brigantines and Bodrum Maritime Museum. The group to be in Bodrum Between June 1-5, will tour Bodrum's historical and cultural places, touristic facilities, Food, drink and entertainment venues and go out on the blue cruise with Bodrum brigantine to see Bodrum' unique bays. 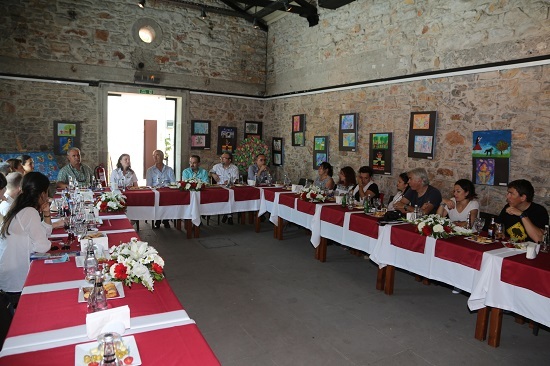 The event which Bodrum Chamber of Commerce supported at the welcoming ceremony on Thursday, June 1 and at Bodrum promotion presentation which organized in Trafo on Friday, June 2, is expected to be ended on Tuesday, June 6.